Isle of Wight ley grid held a few surprises not least the correlation with the now infamous GP triangle of 51.5 degrees, which seems to be involved in most consciousness grids to date found around vortex points. Was the Great Pyramid laid out with knowledge of sacred / holistic ratios and the interactive properties of the 51.5 degree triangle with hex and pentagonal geometry ? …. starting to look that way…. I believe it to be a message in stone for our time. Geometry is geometry…it isn’t polarized to any belief system…I do however believe its properties can influence what it is fronting especially if it is in holistic proportion to the Earth and Universe in general. 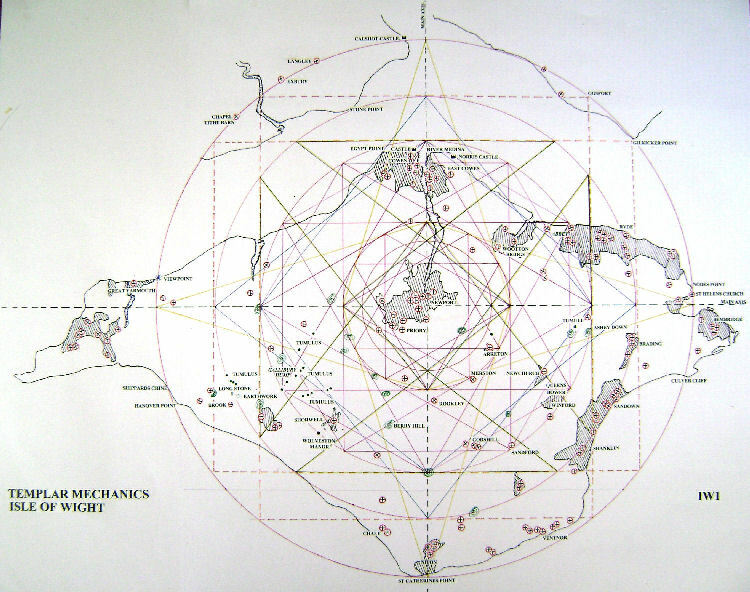 Holistic geometric systems are installed in the mechanics of our Solar system and beyond. Venus for example makes 5 alignments with the Earth and sun creating a regular penta in the heavens. There is a grand design…the Universe is not chaos, it is structured and ordered to mathematical principles. So why should it be considered 'off the wall' to suggest that these same patterns /codes may be mirrored in the landscape, just as it is in nature…through the snowflake,honeycomb and numerous hexagonal and pentagonal flora……...as above, so below. Going back to some of the first systems discovered by templar mechanics, such as Temple Bruer it can now be seen the 51 degree triangle was there also. Temple Bruer preceptory has a lane next to it called Temple lane which led to the templar settlement from the great North Road called Ermine street,……Temple lane has a merging with another green lane that goes back up to the vortex point where 5 lanes meet, and 18 churches align through, that being Temple Bruer church. Measuring the angle showed 51.5 degrees from Temple lane back up to the vortex point, the ancient green lane marking the alignment……not only that if the line was continued it went to the Temple Bruer grid centre at Navenby marked as water feature. The new addition to the Bruer geometry was complimentary to the original geometry backing up the original revelation. When a grid is completed we usually walk and dowse the site to get a greater feel for what is there. Often a synchronistic point nudges us to take further note of the line of investigation we are on. The discovery of consciousness grid is often confirmed through serendipitous ways, then backed by hard accurate geometry. 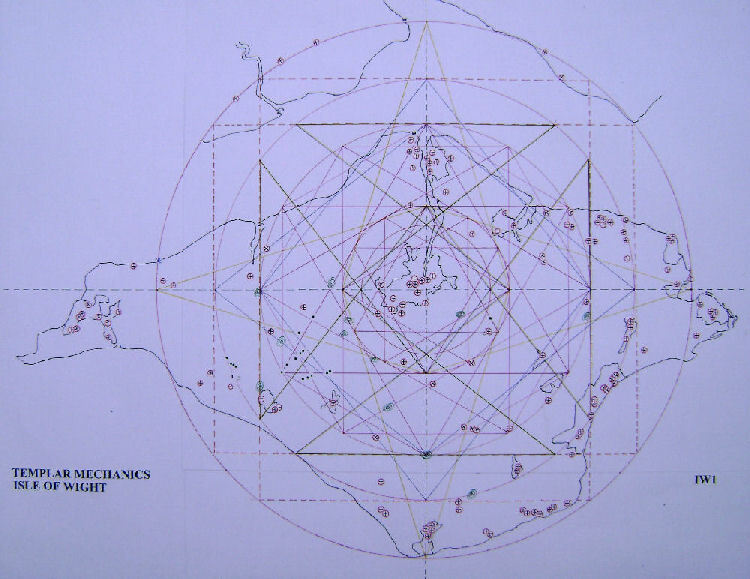 1 Templar site showing landscape geometry a coincidence, 10 sites looks less so, same measure being used at each site ,even less so, repeating geometric patterns at each site ….coincidence? Now, who came up with the name ‘Egypt point’ for this notable landscape feature on the Isle of Wight so far from Egypt?….this mystified us also until we noticed the GP 51.5 degree triangle leaves the main earth radius circle at Egypt point, coincidence again maybe…like the point in the Wiltshire Temple Rockley geometry called ‘Clock mount’ sitting exactly on the 10 o clock position within a twelve pointed clock centred on Temple Rockley. To me they are both examples of ‘magic in progress’…whether people believe it to be coincidence or not doesn’t change the magic in seeing it revealed. 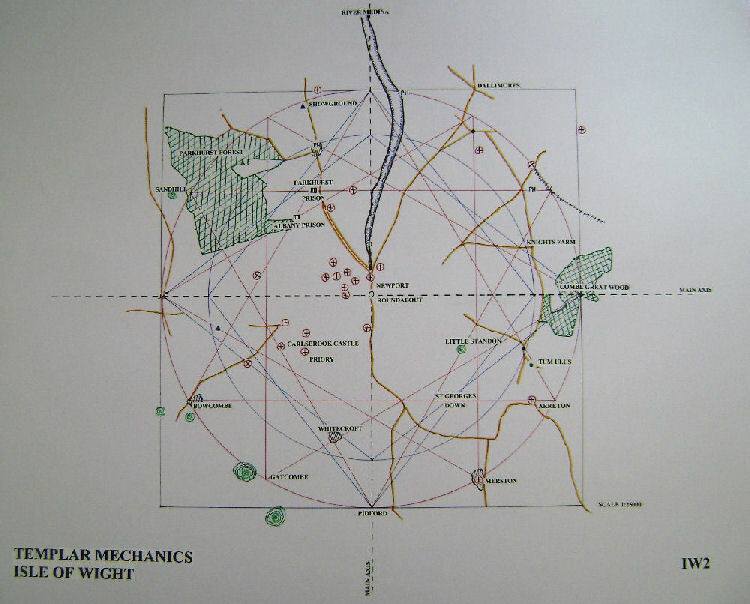 William Buehler has taken the Isle of Wight grid and linked it in with a larger system centred on Stonehenge his thoughts on this will be posted in the Reshel section of Templar Mechanics off the Knights Templar tab. The main Isle of Wight system is a marvel of interlocked sacred geometry including 36 / 72 penta mechanics along with complimentary Hexes and GP Holistic ratios. 4 large pentas N,S,E and West...with another 4 pentas encased within them and then another 4 with 60 degree triangle top arms. Main inner circle is 12 pointed double hex, which is repeated again on The next circle up created by 51.51 GP triangle bringing in Earth / Moon holistic ratios. This system is picking up features on the opposite shore including ancient ruined church, castle and coastal points. Maltese cross effect created by the pentas ...coloured Yellow...all the angles are there 72 and 36 degrees 60 degree Hex lines in purple. 51.51 Gp triangles in Blue. Pentas shoulders worked beautifully if extended recognizing land features such as the waterway inlet Nw corner and the small point/peninsular NE corner...the outer circle cutting through this feature also. Hex lines and penta shoulders are also noting land extreme/end points. The main water inlet, river Medina, flows into the central area from the North tracking the axis, note the change of direction on meeting the second circle out..this is similar to Kings Lynn, although Kings Lynn estuary/river made a 120 degree( Hex related) turn near St Margaret’s church. The Isle of Wight central vortex looks to be a sink hole /low point like Rockley, Bruer, Isle of Man etc. Further investigation at the site would reveal the lay of the land which is hard to discern from Earth image attached. 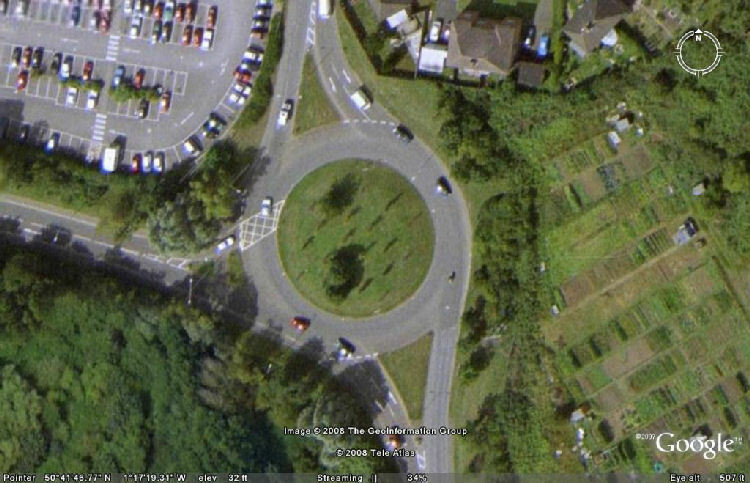 I recently discovered the Glastonbury rock venue location to be sited at the base of one of the extended pentacle legs from the Temple Cloud system nearby at Kings Hill which was also the centre of a twelve pointed double hex spinner. This made me curious as to the locations for the various concerts and festival on the Isle of Wight over the years. Godshill, Wooton, Afton Down, Sea close park – Newport. It may be the festivals were at points or on lines involved in the geometry. Interesting landscaping at the vortex roundabout creating an ‘eye’ effect. The 4th circle from the centre hits a whole load of churches running with the curve of the circle down the East side. This is a complicated graphic and should be looked at for several minutes to see just how intricate and proportional it is to the other patterns within it. The longer you look at it the more you will see. Numerous churches are interacting with the grid as well as significant land points,castles, ancient earthworks and standing stones. Both Albany prison and Parkhurst prison fall on double hex cross over lines …see IW2 graphic. St Georges Down runs with the hex line. Knights farm is also to the East. 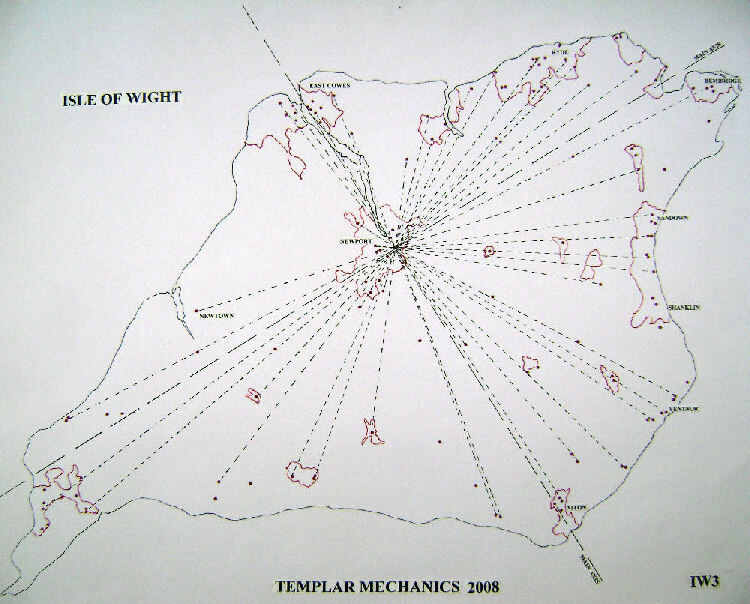 I know of no templar involvement on the Isle of Wight, yet there is little doubt it is a sacred place, and an Earth energy point of some significance. Anyone with information suggesting there was a Templar settlement on the Isle of Wight, I would like to hear from you… with hopefully some sites of note. Here’s the colour coding for the Isle of Wight geometry.